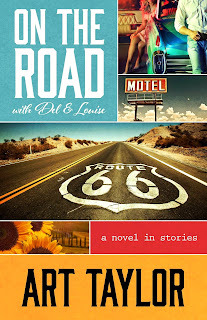 On the Road with Del & Louise … comprises half a dozen linked tales about a generally optimistic but trouble-attracting couple who meet by the oddest chance, when Delwood Grayson, wearing a too-hot wool ski mask and toting a pistol, comes to rob the 7-Eleven in New Mexico where Louise has been clerking. It’s the most polite robbery imaginable, with the bored Louise even giving the thief her phone number, hoping he’ll call sometime. Incredibly, Del does just that, and the next thing you know, this pair have set off in his old Nova on a cross-country odyssey that will include their stealing a painting, getting involved in a real-estate scam, peddling hot microwave ovens, planning a major wine heist, getting trapped in a Las Vegas wedding chapel holdup, falling into a kidnapping in North Dakota and … well, didn’t I say they were magnets for trouble? After years of penning crime-oriented short fiction for Ellery Queen Mystery Magazine and other publications--and collecting a shelf-full of prizes for his efforts--Taylor’s inaugural leap into novel composition has paid off rather handsomely. I wasn’t sure what I would get when I cracked open On the Road with Del & Louise (which I keep wanting to retitle On the Road with Thelma & Louise, for understandable reasons), but my expectations were ultimately exceeded. This is not a flawless work; indeed, one chapter, “The Chill,” requires your accepting some pretty dubious developments. However, the combination Taylor provides in these pages of convincingly eccentric characters, humorous situations, and fragile souls in need of hope--all narrated by the sassy 27-year-old Louise--both charms and disarms. I can only agree with Criminal Element’s review of this book, in which Terrie Farley Moran opines that “making the reader connect to the characters is clearly Taylor’s forte.” It’s no wonder author Taylor, who had recruited Del and Louise for an Ellery Queen short story several years ago, wanted to explore what might have happened to those lovers next--the result being On the Road. As you may already know, Art Taylor is a 47-year-old North Carolina native (the same state from which Louise hails! ), who attended Yale University and is now an assistant professor of English at George Mason University in Fairfax, Virginia. He’s married to editor and writer Tara Laskowski (Modern Manners for Your Inner Demons), with whom he shares a very active young son, Dash. 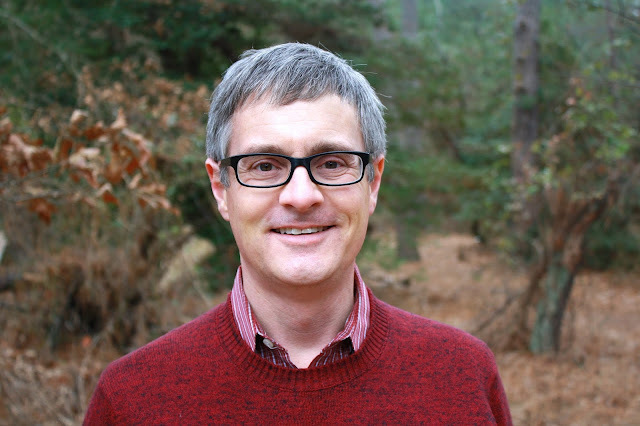 In addition to On the Road with Del & Louise, Taylor has another book coming out soon, Murder Under the Oaks, an anthology he edited to commemorate next month’s Bouchercon World Mystery Convention in Raleigh, North Carolina. I recently e-mailed Taylor a (lengthy) series of questions about his personal history and professional career, which he was kind enough to answer. He even supplied some tips to Bouchercon 2015 attendees on what they should see and do while in Raleigh.Some of his responses I fit into my latest Kirkus Reviews column, but the majority--featuring the “surprise or two” he likes to promise readers--are posted below. Author Art Taylor, photographed by Tara Laskowski. J. Kingston Pierce: You were born in Richlands, North Carolina. What sort of town is that, and what was it like for you to grow up there? Art Taylor: Richlands is a small rural town in eastern North Carolina--less than a thousand people when I was a child there, good people, a lot of tobacco fields and hog farms, and the sense that everybody knew everybody. I remember what seemed like the whole town gathering the night the Piggly Wiggly burned down, the only big grocery store in town, and then the way it changed everyone’s routines until the store could rebuild. My father was the Chevrolet dealer there for 20 years, one of only two small car dealerships in town when I was born, and I remember when the Ford place went under. I’d thought it was a good thing at that young age; now all the business would be Dad’s, right? Dad let me know it wasn’t good, not at all. It was a fine place to call home, and my childhood was a happy one. My friends and my [younger] brother and I were always tromping through the fields and woods around our houses, building forts, riding bikes--the world ours, it seemed like, adventures awaiting, even as I realize in retrospect how insular, in many ways, any sort of small-town living can be. I’ve actually tried to write about it in my fiction--revising now a piece that I’ve worked and worked (and maybe overworked) for umpteen years to try to explore what it meant to grow up there. JKP: Were you a big reader when you were young? AT: I was indeed a big reader--related in another way to that adventuring I mentioned. Books opened up the world even further, perspectives on the wider world. My mom always read to me each night as a young child, same as my wife and I read now to our own son, Dash. I remember being thrilled when I got my own subscription to the Junior Literary Guild, and I still have boxes of those books waiting till Dash is old enough. Not all of it was mystery in those days, but mysteries are the ones which have had the most lasting influence--Encyclopedia Brown, Nancy Drew, The Three Investigators, those three series in particular. And then as part of one of those school fundraiser programs, I sold magazine subscriptions to the neighbors and ended up subscribing myself to one of the featured titles: Ellery Queen Mystery Magazine. That quickly became a favorite too, and it’s still hard to believe that I’ve been published there myself. JKP: As you were growing up, were there people in your life who encouraged you to read or to write? AT: There’s a lot in the news these days about the poor state of North Carolina’s education system, and I recognize the struggles and challenges, especially in the current political climate. But the teachers I had--especially the English teachers--were nurturing and encouraging and pushed us to think deeper, articulate ourselves better, write more precisely. Betsy Travis, my English teacher in the 7th through 9th grades, introduced us to The Odyssey, Beowulf, and Ivanhoe, and to Shakespeare and Hugo and Emerson and Thoreau and I don’t know who else. And her lessons in diagramming are still the basis for everything I know about writing at the level of the line. I can’t help but see sentences in spatial terms, always. In addition to teachers, and then my parents themselves, we had a small but very supportive library and a community devoted to expanding it. I remember when the library was a single small room in the corner of a community center and then when they moved into much more spacious digs downtown. I was a regular user, and our librarian (I’m sorry I can’t remember her name!) was always willing to indulge my interests in books that might well have seemed too old for me at the time. The same was true of the owner of The Book Cellar in nearby Jacksonville--treasure houses, each of those places. Harry Kemelman’s Rabbi Small series was a favorite there at the cusp of those teen years, John D. MacDonald’s Travis McGee series too, and all the James Bond novels, and then John le Carré’s Karla trilogy--at least some tentative steps into that last series. JKP: When did you first know that you wanted to be a writer? AT: As I look back on even those earliest years, my love of reading and my desire to write always seem inextricably intertwined--the joy I got from reading and the desire to provide that same experience to some other reader myself. I distinctly remember telling my third-grade teacher before Christmas break that I was writing a book and that it would be in bookstores sometime in the spring. (A longer journey ahead than I knew in terms of a first book!) And I was always entering school writing contests--poetry mostly at that age. JKP: I understand that you attended an all-boys boarding school at some point. Which one, and how did that experience shape you? To a great degree, getting there was thanks to my parents’ commitment to my education--for which I’m eternally grateful. Between elementary school and junior high, they’d worked to get me enrolled in a brand-new gifted and talented program at a nearby school--I still bristle a little at that “gifted and talented” phrase, but it proved a great privilege to be part of it and a turning point in my life. Going away to boarding school was the same, both in terms of the education in the classroom and the broader perspectives and experiences I gained being so close to a major metropolitan city--to the Kennedy Center and Arena Stage and the Folger Library and … well, you name it. And without attending EHS, I’m not sure I would even have applied to Yale, much less gotten in, so all this is part of a continuum of sorts in my mind. And there’s a whole world of stories that could come out of the boarding-school experience--same as most high-school years, but maybe more intense, given how concentrated those experiences are. JKP: Was it after you finished up at Yale that you moved to Raleigh, North Carolina, or before? AT: Not until several years after. When I graduated from Yale, my parents gave me a year off to try to work on my writing--pursue that dream--and I lived in Atlantic Beach, North Carolina, for that year. (Most of my writing turned out pretty bad.) Then I ended up working with my dad, selling cars for a couple of years at the dealership, which was in Goldsboro, North Carolina, at that point. It was during this time that I moved to Raleigh--still writing, of course, both fiction and increasingly some journalism. JKP: In fact, you wrote literary news and book reviews for Metro Magazine in Raleigh from 2001 to 2011. Was it then that you also began taking a serious interest in penning fiction? AT: Creative writing was first always, but from high school on, I also pursued journalism as well. I began writing film reviews for the school paper at Episcopal--reviews that were ultimately picked up by two newspapers in North Carolina: the Jacksonville Daily News and the Goldsboro News-Argus. In Raleigh, I wrote book reviews and other articles for Spectator Magazine, a local alternative weekly, and eventually became managing editor there--a gig which led to my work with Metro and really to my writing for other publications, including now The Washington Post and Mystery Scene. JKP: As a fledgling fictionist, who were your models for success in the short-story field? Who did you most wish to learn from or emulate? AT: Reading Hemingway was formative in my high-school years, and then later some of the great masters of short fiction generally: Raymond Carver, of course, and Eudora Welty and Flannery O’Connor … and in the wake of the previous question, it’s not lost on me that these are among the biggest names in “serious literature” of the 20th century, though you’ll also find O’Connor’s stories anthologized in crime anthologies, of course, and one of my favorite of Welty’s stories, “A Curtain of Green,” brims with violence. But hand-in-hand with reading those writers and all that New Yorker fiction (I subscribed to that too), I was also entranced with [Edgar Allan] Poe, whose comments on the “single effect” in short-story writing still provide guiding principles. And I was still reading widely in Ellery Queen Mystery Magazine, Ed Hoch and Hugh Pentecost maybe chief among the writers I followed regularly there. Topping all of them, Stanley Ellin stands as the writer I’d most aspire toward emulating, though I really came to his work later. He set the bar for all of us--still a high one. JKP: Let’s talk about On the Road with Del & Louise, this “novel in stories” you’re just now welcoming into the world. You have said before that you think the “novel in stories” is “one of the most exciting trends in fiction today.” Why do you make that case? And what does such a novel offer the writer or the reader that a conventional novel doesn’t? AT: Was I wearing my marketing hat at the time? While it may sound like hyperbole, I do appreciate the structural opportunities available to writers in this form. My own book is fairly conservative in that direction: the six stories all keep the same perspective and follow one another chronologically, though with slight leaps in time from one to another. But when I consider the furthest extremes of structuring such a cycle, I’m excited by the idea of fragmented storytelling--bits and pieces of a narrative coming together in a mosaic of sorts: different points of view; different characters from a complex narrative or wider community; stories from the past, present, and future of a place; greater leaps like that. The possibilities there strike me as exciting on a storytelling level, distinct from the excitement of the story itself. When I read a book like Steve Weddle’s Country Hardball , I’m thrilled as much by the daring architecture of the book as by the story that it tells. The novel is an incredibly flexible form, and while I certainly appreciate conventional novels, I also enjoy seeing writers push that form in fresh directions--structurally, aesthetically. JKP: Young, spirited, and oft-reckless Louise is the narrator of your new book. Did you have a difficult time assuming a woman’s viewpoint? Did you have any particular person’s voice in your head, telling the tale through Louise’s mouth? AT: Louise’s voice is what drives these stories, no doubt about it, and I wish I had some idea where it came from! The drafting went best when I felt like I was channeling that voice accurately, stumbled most when I couldn’t seem to catch it. Looking back at other stories, I myself find it interesting how often I’ve ended up writing from a woman’s perspective--whether first-person, third-person, or even second-person (two cases of that). It’s something I’ve tried to figure out myself, why I’m drawn in that direction. For one thing, women simply strike me as more interesting than men, but I’m sure there’s more to it than that. JKP: The other crucial player in this new novel is Louise’s mother, Cora, who constantly utters concerns that Louise is making mistakes, that she’s headed toward the same disappointments that Cora herself experienced. What sort of gravity does Cora exert on your plot? AT: My editors at Henery Press told me that the scenes with Cora really brimmed with energy, and I’ll admit I loved writing her from the first--again I hope that readers might agree. Even in the stories where she’s merely a voice on the phone, she still has great power over Louise--and indirectly over Del. She’s part of the conflicts that span the stories, struggles that only find resolution in the final story when all three characters are finally face to face. One of the book’s lingering concerns is the dual role of the past: on the one hand, something to escape (or at least to avoid repeating) and, on the other, an entity that exerts its own gravity (to rework your own word), the pull of nostalgia. To some degree, Cora embodies both--that desire to break free from a family member, be your own person, at the same time that you want to maintain good relations, make peace with people to whom you’re inextricably linked. JKP: Remind me: Del’s full name is Delwood Grayson, as I recall, but do we ever learn Louise’s full name in this book? AT: Maybe it’s a result of writing on a smaller canvas generally, but I don’t always think of last names for my characters--sometimes not even first names. In my EQMM story “The Odds Are Against Us,” for example, the narrator is never named at all. Delwood got a last name because of a scene with caller ID; his name shows up when he first calls Louise. But no occasion for Louise’s last name presented itself until late in the manuscript, and I eventually decided against giving her one--for several reasons. At that point in the story it would’ve been too jarring to introduce it suddenly. Reworking it into the earlier stories (for balance) seemed unnecessary. And Louise didn’t seem to need it either: her voice, her attitudes, her everything seemed big enough, full-bodied enough, all on their own. JKP: The second story in your book, “Commission,” finds Louise and Del going to live with his real-estate agent sister out in California, and there becoming mixed up with thefts of microwave ovens and such from vacant homes. It’s the most complicated plot you’re offering here. Is it perhaps based on some real news story? AT: “Commission” grew out of the setting--in an unexpected way. When I wrote the first story, “Rearview Mirror,” as a standalone, I had to pick someplace that Del and Louise were headed--so I randomly chose Victorville, California, just a dot on the map, thinking what did it matter? And the same with Del’s sister’s job in real estate--a random choice. It was only when I began drafting the second story years later that I actually investigated Victorville itself in more detail and discovered that it was among the hardest-hit areas when the real-estate bubble burst--a boomtown with high ambitions that quickly went bust, with lots of vandalism and thievery as fall-out from that bust. More than just backdrop, Victorville’s woes helped determine the story’s plot--which was a surprise even to me, again having picked it on a lark initially. And again, here too, family plays a significant role--Del’s sister, Brenda, being similar to Louise’s mother in some respects. 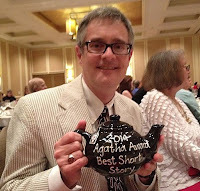 (Left) Taylor shows off his 2015 Agatha Award. JKP: Correct me if I’m wrong here, but you’ve won two Agatha Awards, a Macavity Award, and three consecutive Derringer Awards for your short stories. In addition, you have twice been named a finalist for an Anthony Award. When you were starting out as a fiction writer, did you ever imagine such accolades coming your way? And how helpful have such prizes been in terms of building up your self-confidence? AT: I cannot stress enough how grateful I am, how fortunate I feel, that my stories have won these awards. Having judged [on behalf of the Mystery Writers of America] the short-story Edgar Awards several years ago, reading upwards of 700 submissions for that purpose, I recognize all too well how many stories are published each year, and how many more fine stories [there are] from online and print publications both that haven’t earned MWA-approved status. Amidst that wealth, even to have my stories read is a true honor. Like many writers I’ve spoken with, I’m frequently plagued by self-doubt; each blank page is a daunting challenge, and the next one behind it often more so. The award recognition helps to counter (somewhat) those fears--to remind me that I have indeed managed to write something of value to others and that maybe, with work, I can do so again. JKP: What’s the most important thing you realize you still need to learn as a fiction writer? AT: Patience--both with developing your craft and with how long it might take to find a publisher and readers. What’s the old Woody Allen quote? Something like, “80 percent of life, of success is simply showing up”? There are different versions of the quote circulating, but I’d up that percentage considerably. Show up, keep showing up. JKP: Reading through a number of pieces you’ve written recently, I get the idea that you’re someone in desperate need of editing. You wrote in Criminal Minds last month about making errors in the Acknowledgements section of your novel, and your wife mentioned in the Washington Independent Review of Books that you tend to overuse words such as “just.” I also remember reading somewhere about how you had thought On the Road with Del & Louise was in good shape … until the advance reader copies went out, at which point you discovered myriad small errors and absent words. Can most of these errors be chalked up to your impatience with the mechanics of writing, or is there some other personal devil at work? AT: That phrase “in desperate need of editing”--yowsa! That’s increasingly all too true. Ironically, I’ve always prided myself on being an attentive, even precise writer, but I’m also a very slow writer by nature--ponderously so, I think--and that’s at the core of my recent troubles. On the Road was written at a faster pace than much of my other fiction, and at a time when my schedule generally was more demanding than usual: a rising number of writing opportunities (I contribute fairly regularly to several publications and a couple of blogs), a steady teaching schedule, the demands of parenting … and then the distractions of social media, a presence which most publishers these days would call part of the job as much as it’s a break from the job. These are issues that most writers face--day-jobs, family obligations, marketing needs--so I know I’m far, far from unique in those respects, but this feeling that I’m constantly fighting against the next deadline … well, that’s caused the biggest erosion of my sense of precision, especially given, as I said, that my usual nature is to write so very slowly. Other factors, too, figure in: All those instances of “just” in my book had been part of Louise’s voice--though perhaps a little went further than I thought? And I really did believe that EQMM had published “Commission” a year before! Time gets away from me. I blame that on parenting too--that old saying that the days are long but the years are short. My perspective has suffered. JKP: Long ago I interviewed a thriller writer named Robert Ferrigno (The Wake-Up, etc. ), who lived with his family in the Seattle, Washington, area but invariably set his dark thrillers in Southern California. He took that approach, he told me, because it kept the darkness of his tales away from the people he loved. Your short stories have sometimes been dark, grim. Have you noticed your fiction-writing change any since the birth of your son, Dash? Are there now subjects you don’t want to approach, or things you don’t want to write because you know Dash will read them someday? AT: Such a good question, and such a weighty one. Soon after Dash was born, I was reading the finalists for the Derringer Awards, and one of the stories dealt with a child who’d been abducted and then rescued and a father’s struggle to determine what to do with the man who’d kidnapped and hurt his son. The story wasn’t graphic at all, but the suggestions were maybe worse—what the reader’s imagination can conjure up—and I could hardly read it, so powerful was the impact on me. Ironically, though I’d never written about children in jeopardy before Dash was born, one of my upcoming stories--“Parallel Play” from the forthcoming anthology Chesapeake Crimes: Storm Warning--does deal with parenting and with kids at the center of some intense conflict. My wife, Tara, is always my first reader, and when she retuned her comments to me on that one, she asked me to please, please never ask her to read it again. We live in a world of great violence, great potential for violence. Maybe confronting it in fiction is a way to defuse some of our fears of it in real life? It will be a long while before I’ll let Dash read that particular story, and several others, but he’ll be at my book launch for On the Road. The sample I’m reading there is about a sock monkey, so we should all be safe. JKP: How old is Dash now? And can I assume he’s named after a certain Mr. Hammett? AT: Dash is around three-and-three-quarters--and going on 16, always. He loves cars and has talked several times about how he can’t wait to be big enough to reach both the steering wheel and the accelerator in my Highlander. And yes to Hammett too--which prompts a funny anecdote about connections and community in the mystery field. Dash recently got his own library card and was blissfully proud of it (he loves books), so I took a picture and posted it on Facebook. One of the comments was from Hammett’s granddaughter, Julie M. Rivett, who noted that Hammett himself had been a great lover of libraries--a level of pride connecting her Dash with ours. Such a small world. JKP: You and your wife both attended George Mason University. Is that also where you first met? AT: Yes, we were both in Mason’s [Master of Fine Arts] program in creative writing, both in the fiction track. I don’t think it’s at all an overstatement to say that our friendship and then relationship were built in part on our mutual admiration of one another’s work. She’s still my first reader, as I said, and my best always--and a stronger writer than I am, no question. Her example pushes me higher in my own writing. (Left) The classic detective-fiction work Taylor most wishes he had written. JKP: I understand that you’re currently working on “three intertwined novellas that may become my second book,” and that all of those tales build around a crime-solving duo--a middle-aged, agoraphobic bookseller and a young accountant who “often suspects the universe is telling her something.” But are there other large writing projects on your to-do list as well? AT: For better or worse, I’ve been juggling work on several short stories this year--taking breaks from the longer, intertwined novellas project for a couple of standalone short stories. This summer, I completed a shorter story with a speculative angle, which I’m recognizing might prove a tough sell, and I’m currently revising a story with a long history, the one I mentioned earlier that deals with growing up in small-town North Carolina: It began as a fairly straightforward short story many years ago, was eventually expanded into one half of a failed novel project, and now I’ve been trimming, trimming, trimming it into a short story again--187 pages cut down to less than 50. I still don’t trust that it’ll ever come together in a satisfying manner, but I’m working on it. In addition, I’ve got another couple of stories in various stages of planning/drafting, including a collaboration with Josh Pachter [a crime fictionist and assistant dean at Northern Virginia Community College-Loudoun] as part of a longer project of his--though he’s maybe given up on me by now! Apparently, in addition to having a toddler calling for my time, I also have him rubbing off on me. My attention seems to be fractured, at best, as I try to keep my concentration suspended between several projects. JKP: Which other authors of crime fiction do you most admire and read? And if you could have penned any novel in the field that doesn’t currently carry your byline, which would it be? AT: My tastes run pretty wide, with longtime favorites ranging from Margaret Maron to James Ellroy among our more recent MWA Grand Masters, for example. Tana French is tops for me in younger writers, as are Megan Abbott and Laura Lippman--and I know I’m not alone in admiring their novels. I mentioned Steve Weddle earlier as well--a tremendous talent--and there are several other short-story writers I admire greatly, probably too many to name without feeling like I was leaving someone out, but David Dean would head that list, surely. 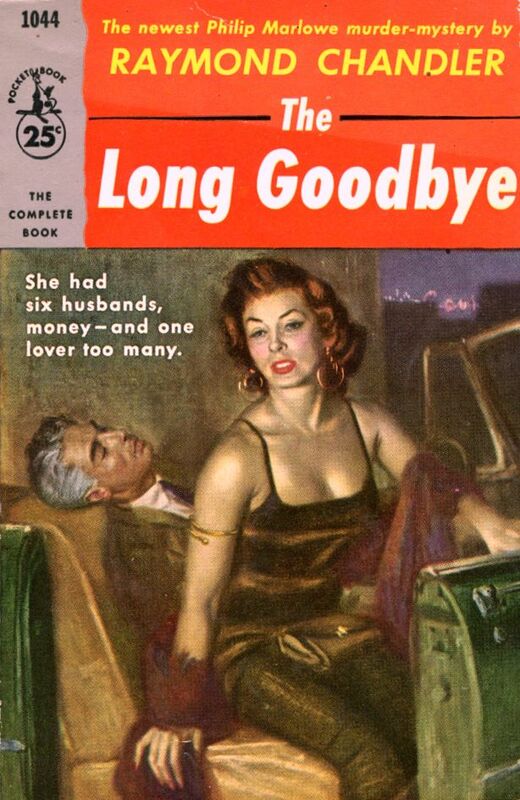 As for books I wish I’d written, that’s easy: Raymond Chandler’s The Long Goodbye. Other end of the spectrum from the tightness of a short story, of course--shaggy at times, and even a little self-indulgent in spots--but such a magnificent achievement. Any of us should feel lucky to write something even half as good. JKP: Finally, with Bouchercon set to open in your old hometown of Raleigh next month, tell us what convention-goers should not fail to see or do while they're in the city. AT: It’s been more than a decade now since I’ve lived in Raleigh, and so much about the city has changed in the time since I’ve lived there, but there’s still much to recommend. The North Carolina Museum of Art is one of the chief cultural jewels of the state, and I still haven’t seen their new galleries—so that’s a must-do for me and should be for others. Bouchercon itself will surely have plenty of opportunities for book-buying, but Raleigh has three great bookstores for folks wanting to browse more widely: the local indie bookstore, Quail Ridge Books, and two great spots for used books, The Reader’s Corner and Nice Price Books, both down on Hillsborough Street. And Raleigh is a great restaurant town too--particularly thanks to James Beard Award-winning chef Ashley Christenson, with several restaurants now under her brand. Personally, I’m looking forward to revisiting a couple old favorites, including the Hayes Barton Café and The Roast Grill, the latter an institution since 1940. I ate hot dogs at the Roast Grill nearly every Saturday--my personal record being five in one sitting!--and I’ll always remember the day that former governor Jim Hunt ended up on the stool right beside me. If you go, say hi to George, tell him Art sent you, but don’t--under any circumstances--ask for ketchup. Thank you so much for including me here! This was such a great conversation for me—pushing me to think of my own work in fresh ways as well. I hope others will enjoy too!